Twenty million tons of water flow hourly over Niagara Falls The utilization of this latent power is a supreme example of mastery over Nature and an engineering feat which has made Niagara River the source of the world’s greatest water-power system. AN AERIAL VIEW OF THE RIVER AND FALLS. On the left are the American Falls, separated by Goat Island from the Canadian, or Horseshoe Falls, over which flows nearly ninety-five per cent of the water. The crests of the falls are some 160 feet high, but the total drop of the river over a distance of 35 miles is 326 feet. This great head of water is the secret of the immense power available from Niagara. MORE than a mile in width, the mighty Niagara River sweeps down the frontier of Canada and the United States of America. Green and deep, the great stream rolls majestically onward until, steeply shelving, the land falls away and the river becomes an irresistible torrent foaming in tumult from bank to bank. Then, as though impatient with the speed of the rapids, the whole vast river bed drops into space and man is presented with one of Nature’s greatest spectacles - the awe-inspiring plunge of Niagara Falls. Twenty million tons of water pour over the Falls every hour. Vast clouds of spray are flung hundreds of feet into the air, and the roar of the waters is heard miles away. Here sweep the waters from Lakes Superior, Huron, Michigan and Erie on their way to Lake Ontario, the St. Lawrence River and the relentless Atlantic Ocean. On the Canadian side are the famous Horseshoe Falls, with a curving crest 2,600 feet long. In the centre of this curve the water is twelve feet deep, and it plunges over the cliff into the pool 162 feet below, the bottom of which is 185 feet lower still. Nearly ninety-five per cent of the water at Niagara flows over the Horseshoe Falls. The American Falls, separated from the Horseshoe Falls by Goat Island, are spectacular in another way. The depth of water is only eighteen inches, but the straight crest is 1,000 feet long and the precipice 167 feet high. For centuries past travellers and writers have attempted an adequate description of Niagara’s grandeur; day and night that down-sweeping torrent casts its spell on all who see it. In winter, the wonder of Niagara is further enhanced by the freezing of the far-flung spray, imparting a silvery coating to the surrounding plants, shrubs and trees. Sometimes in the depth of winter the Falls are frozen solid from bank to bank. All action is suspended and the giant icicles provide another wonderful aspect of Niagara Falls. The wonder of Niagara River does not, however, begin or end at the Falls. Between Lakes Erie and Ontario the river drops 326 feet in a distance of thirty-five miles, and here is the secret of the river’s mighty power - its huge “head” of water and its enormous volume. Above the Falls the river races through the rapids at over thirty feet a second, and below them the torrent sweeps through Niagara Gorge, seven miles long with banks that are in places as much as 300 feet high. It is estimated that nearly four hundred centuries ago the original Brails were at the entrance to Lake Ontario and were only thirty-five feet high. For 35,000 years the waterfall, fed only by Lake Erie, cut its way back along the Niagara Gorge. Then the other great lakes, cascading one into another. augmented the outflow from Lake Erie and the erosion was accelerated so that in the space of a further 3,500 years the Fall carved out the remaining four miles of the gorge. ONE OF THE GENERATORS which are driven by the turbines at the Niagara power stations, in course of construction. The stators (stationary outer frames) of these generators are enclosed in drums which are perforated to assist in the all-important ventilation and cooling of the windings. The machines shown at work inside the stator are vertical planing machines, surfacing the ribs. In the Queenston Generating Station there are ten of these huge generators, each developing 55,000 horse-power or more. Niagara Gorge, cut from the solid rock by Nature’s hand during forty centuries, was presented to man at the moment when he was ready and able to use it. In forty years man has made for his own use at Niagara the greatest water-power system in the world. But man’s first demands on Niagara were modest. A quiet wayside stream with a small weir would have met the requirements of the pioneers. No advantage was taken of the enormous height of the falls, or of the vast volume of water awaiting use. For many centuries the use of the water-wheel had been known to mankind, for grinding corn, sawing wood, irrigation and other purposes. It was impossible, however, to build water-wheels by the fast-flowing Niagara River. Thus during the early part of the last century, American engineers dug canals which short-circuited the bluff on their side of the river. Water, taken from the stream above the falls, flowed through these canals to the wheels of water-mills situated along their banks. The waste water was allowed to flow down the cliff face into the pool below the falls. The term “waste water” is peculiarly apt in this instance, but man's first onslaught on Niagara Falls had been made. In the early ‘eighties of last century a Mr. Evershed was sent to Niagara to superintend the, demolition of some old buildings on the American side of the river. Their removal was a preliminary to the creation of a park on the banks of the waterway. The buildings were duly removed. and the nark was laid out, but Mr. Evershed was also considering the best means of harnessing the great waterfall whose thunder was constantly in his cars. His idea was to dig canals from one and a half miles above the Falls to lead water to mills on top of the bluff. The waste or “tail” water was to be discharged from the mills into a tunnel which led to the lower reaches of the river. Evershed calculated that only four per cent of the river flow would be required to work his scheme - a figure that was to be increased tenfold in later years, as Water-power undertakings grew in size and number. The question of water diversion from the Falls later became so serious that in 1909-10 a Boundary Waters Treaty was signed between Great Britain and the United States, limiting the daily diversion of water. Back from the cliff face the great Evershed tunnel was cut, deep below the mighty bluff round which sweeps Niagara River. For 7,000 feet into the rock the engineers drove the underground waterway, 21 feet high and 19 feet wide. The tunnellers did not know how the power of the water was going to be used, whether by water-wheels, by hydraulic engines or by turbines. To the men who drove that tunnel only one thing mattered - they were going to make use of the Falls’ great height for the first time. Only one mill, a paper-mill, made use of Evershed’s scheme. The mill-owners’ engineers excavated a huge pit, 178 feet deep, with an outlet leading into the tunnel. At, the bottom of the pit the paper-mill owners installed a set of water turbines developing 8,000 horse-power. And the mill owners went a step farther than the adoption of the water turbine, for the invention of the dynamo and the alternator had ushered in the electrical age. The vertical shafts of the mill turbines were coupled to dynamos generating electricity at 2,200 volts. Hydro-electric power had arrived. 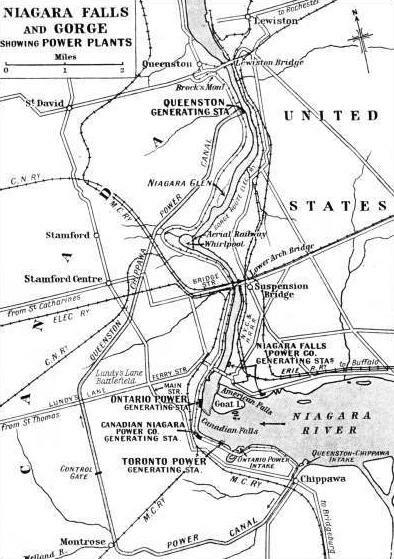 It is not possible to describe in detail the theory of hydro-electric power generation and transmission, but a brief outline will assist in the understanding of the great development schemes at Niagara. Water is taken from the river at its higher level by booms or intakes, which are enormous walls of concrete with openings below water level. Some of these openings are placed at the bottom of the intake wall, so that in winter, when the surface of the river is frozen over, water is still available beneath the ice. At Niagara the tails may be frozen solid from bank to bank, but the power stations carry on. From the intakes water is conveyed in canals or pipes to racks or screens which intercept floating debris. Thence it passes through gates or valves to huge pipes known as penstocks. These pipes lead down to the turbines, great steel drums which contain guides or nozzles directing the tremendous jet of water against the vanes of runners - the rotating portions of the machines. The flow of water to the runners is controlled by governor gear which regulates the speed of the turbines. When the water has imparted its mechanical energy to the runners and caused them to revolve, it escapes through the draught tube of the turbine to the tailrace leading down to the lower level of the river. At Niagara, where alternating current is produced, the moving portions of the generators, known as rotors, revolve in stationary castings known as stators and wound with insulated copper wire. The rotors are energized, that is, turned into electro-magnets, by separate dynamos, called exciters, attached to the main shaft. As the rotors revolve they cause an electric current to be induced in the stator windings, and this is led off by cables to the transformers. An advantage of alternating current is that its voltage can be increased by the use of “step-up” transformers for economical transmission over long distances. At suitable places throughout the country the current is “stepped-down” to a voltage suitable for industrial and domestic use. The paper-mill which derived its power from Evershed’s scheme was the forerunner of other hydro-electric stations on the American side of the river, built solely for the transmission of power to the surrounding towns and villages. So was accomplished yet another step towards the fullest use of Niagara. Important as were the American generating stations, it was from the Canadian side of the waterway that Niagara was finally conquered and harnessed. Late in the last century a subsidiary of the American Niagara Power Company was formed to build a power station on the Canadian side of the river, above the Falls. At the beginning of the twentieth century Canada’s own schemes were begun, and of these one of the most interesting is that of the Toronto Power Development. BUILT ON RECLAIMED LAND, the Toronto Power Generating Station is situated near the rapids above the Horseshoe Falls. The ground on which it stands was once covered by a depth of from 8 to 24 feet of water, and the foundations are laid in the solid rock of the river bed. The water intake is immediately in front of the building, but the outlet is in the face of the Horseshoe Falls, the water flowing from the turbines through a tunnel 900 yards long and 50 yards below the river bed. The directors of this concern decided to build their power station above the Horseshoe Falls, and, apart from the amazing ingenuity of the engineers engaged in this mighty task, all honour must be given to the men whose imagination and foresight planned a power plant capable of meeting the demands of future developments. No effort was spared to preserve the beauty of the Falls and the amenities of the neighbourhood. The problems facing those pioneers of hydro-electric power must at first have seemed almost insuperable. At their feet lay a raging torrent of broken water, in places only 8 feet, in others over 24 feet deep, rushing headlong to the Falls at a speed of 30 feet a second. Under that fearsome flood lay the solid rock on which the engineers had been ordered to build their power station. The reclamation of the building site called for courage of a high order, for one slip into the waters of the rapids meant death, swift and inevitable. With pile and steel coffer-dam blasting powder and steam shovel, the land was at last won from the river and the power-house foundations were laid in the solid rock of the river bed. But where were the turbines to be placed, and how was the head of water to be obtained to work them? The answer lay in the next move of man, perched precariously on the edge of the power-house floor overlooking the upper rapids of the great waterfall. The engineers made preparations to bury their turbines deep in the bowels of the earth, deep in the silence below the plunging flood, out of sound of its ceaseless roaring. The engineers carved an enormous cavern out of the solid rock, 416 feet long, 22 feet wide and 156 feet deep. 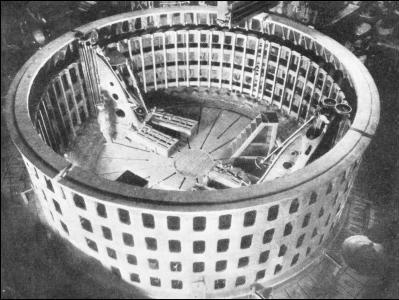 They lined this wheel pit, as it was called, with bricks - hundreds of thousands of them - and then to the concrete foundations in the deep floor they lowered the giant turbines. There are eleven turbines, and from Niagara’s vast store of energy they extract 150,000 horse-power. Rising vertically from the turbines are eleven great steel shafts, supported by an immense flying arch that spans the wheel pit. The upper end of each shaft carries the rotor and exciter of a huge electrical generator, the stator of which is enclosed in a great drum, perforated to assist in the all-important ventilation and cooling of the windings. In a long line stand the generators, filling the great floor of the power house. 467 feet long and 91 feet wide. This power house is built of Indiana limestone and stands 80 feet high. The current, at a voltage of 12,000, is taken to a transforming station built on a hill overlooking the Falls. T HE generators, humming quietly alongside the rapids, tell nothing, however, of the drama enacted far under the Falls. To visualize the hidden wonder of this early power station we must trace the course of the water from the intakes in the river above. The engineers built steel penstocks leading down to each turbine. Through these eleven tunnels of steel the water thunders down, to swirl with irresistible force through the great vanes of the turbines, spinning the runners round more than four times a second. And then comes the moment of escape, for the water must find an outlet to make room for the inexhaustible torrent seeking service in the great machines. A SLUICE-GATE on the Chippawa-Queenston Canal. Water is diverted from above the Falls and conveyed to a generating station at Queenston, some 5½ miles below the Canadian Falls. Part of the canal takes the course of the Welland River, the direction of the river's flow being reversed for this section of its length. The gate shown has a span of 48 feet, and canal tug boats can pass beneath it when it is fully raised. The builders drove two tunnels, flanking the wheel pit on either side, and converging at their lower ends into one main tunnel. Now followed an engineering feat that must have left its impression on the minds of all who were privileged to participate in it. The engineers drove a tunnel 900 yards long - 50 yards below the river bed - to seek an outlet in the face of the Horseshoe Fall. Deep in the rock, with workings lit by electricity, the tunnel gangs pushed ever forward to where, they knew, must hang a vast curtain of living water. The reward of their labours was an outlet for the torrent from the turbines, and the spectacle of Niagara’s majesty - close, unshrouded by mist, awe-inspiring in power and grandeur as the green waters plunged ever downward before their eyes. More power was demanded of Niagara - man’s numbers were increasing and his needs were ever mounting. Yet another power station was planned, and this time the foot of the Falls was chosen as the site. 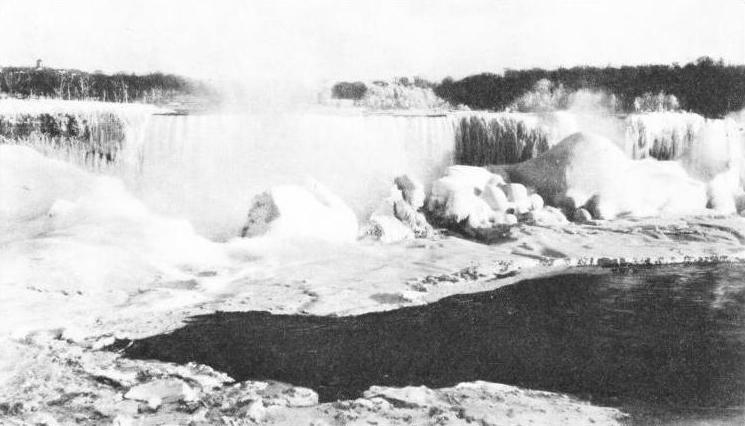 Larger and more efficient than the Toronto scheme, the building of the Ontario Power Development at the foot of the Falls was begun in 1902. 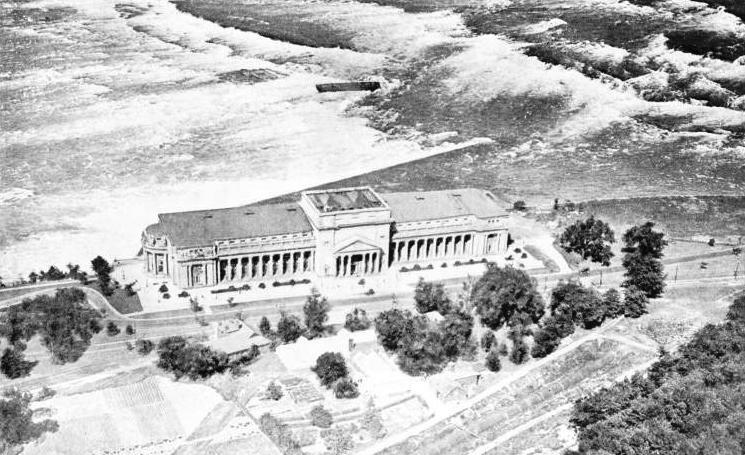 Foundations for the Ontario Generating Station were hewn from the base of the cliff opposite Goat Island, and all nature lovers must reserve an appreciative thought for the men who designed this building. Despite its size, 778 feet long, 80 feet wide and 72 feet high, it harmonizes perfectly with the face of the cliff behind it. NO TAILRACE tunnel was required for this scheme, for the water escaped directly into the pool below the Falls; hut the necessity for taking water from the upper river presented the engineers with an unusually difficult problem. They were debarred from building an open canal from their intake just above the Upper Rapids, because the whole cliff top was required as a public park. It was decided to carry water from the intake and screen house above the Falls to the distant generating station through giant pipes laid below the ground. The engineers dug enormous trenches along the cliff top, laid their water conduits and again filled in the huge ditches, leaving the land as they found it, with the beauty of the scenery unimpaired. It is estimated that the Ontario Power Company spent over a million dollars (£250,000) for the sole purpose of preserving the beauty of Niagara’s natural surroundings. The size of these vast water pipes gives an indication of the excavation that had to be carried out to accommodate them. They are each 6,500 feet long; two are 18 feet in diameter, and the third measures 13 ft 6 in. It was in this manner that Canada’s engineers brought the waters of the Upper Rapids to a point on the cliff top directly above the great power house. Now followed the task of conveying the water through the solid rock of the cliff to the turbines. Tunnels were cut in the rock to accommodate sixteen steel penstocks varying in length from 225 to 317 feet. The alternators and their twin-turbines are arranged horizontally at the Ontario Power Generating Station, providing a wonderful display of giant machines in one vast hall. NIAGARA RIVER is the scene of some of the greatest water-power undertakings in the world, for nowhere else are a large uniform flow and a steep descent combined as they are within the few miles of river shown in this map. The Queenston-Chippawa Power Canal was built to by-pass the Falls, carrying water to the generating station at Queenston, in the lower reaches of the river. The other main power stations are grouped round the Falls; the largest two of these, belonging respectively to the Toronto and Ontario Power Companies, are both on the Canadian side of the river. Towering above the floor of the power house the great alternators spin round at 187½ revolutions a minute, the attendant engineers appearing mere pygmies in comparison with the enormous bulk of their powerful charges. Although the machines in this station arc permitted to display their might, all else is hidden within the rock. In addition to the buried water conduits, the cables leading to the transformer and distributing station are carried underground and access to the power station is provided by an elevator and a tunnel from an entrance building in Queen Victoria Park on the cliff top. The output of the Ontario Power Development, Station was 185,000 horsepower - but still further demands were to be made on the pent-up power of Niagara River. In December 1925 the engineers of Canada completed the Queenston Chippawa Power Development scheme, with a peak capacity of 550,000 horse power - and claimed to be the largest and most efficient single hydro-electric power plant in the world. 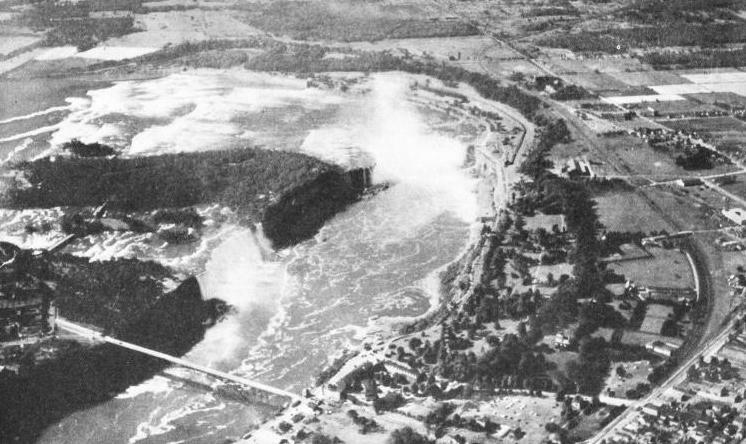 The plan of the engineers was to build an intake in the Niagara River at Chippawa, two miles above the Horseshoe Falls. Then the Welland River, from Chippawa to Montrose, was to be canalized and enlarged, and its flow reversed for a distance of four miles. From Montrose a canal eight and three-quarter miles long was to be built to a forebay (triangular basin) and screen-house situated on the cliff above the power house near Queenston, on the lower reaches of Niagara River, about five and a half miles below the Canadian Falls. The cliffs at Queenston rise 309 feet above the level of the water. 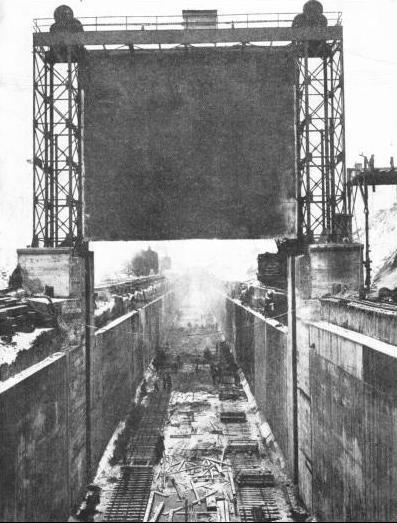 The works at Chippawa were carried out on an immense scale A great concrete boom was built out into the river, equipped with fifteen openings each 18 feet wide, and with six submerged openings for use in winter conditions. The building of the canal was a tremendous task: some of the cuttings through solid rock are 85 feet deep. Earth cuttings are 70 feet deep in some sections, and in places where earth surmounts rock the bed of the canal is 143 feet below the level of the ground. Fortunately, with abundant electrical power close at hand, the engineers of the Queenston Chippawa project were well equipped for their great, task. Eighty-three miles of standard-gauge track were laid to remove material from the canal, and this railway was mainly operated by electric locomotives. Electric, too, were the giant power-shovels used in the work of excavation. Five of these were of the largest type in the world, each capable of loading a truck of 20 cubic yards capacity, standing 60 feet above the excavation, in a minute and a half. NEARLY thirty million cubic yards of earth were excavated and over four million cubic yards of rock were blasted from the bed of the waterway. At the entrance to the rock-hewn portion of the canal is an enormous 100-tons sluice-gate, operated electrically and supported on steel towers. The gate has a clear span of 48 feet and, when fully raised, permits the passage, beneath it, of a canal tug boat. Across the base of the forebay near Queenston is the great screenhouse, 500 feet long. This accommodates the openings leading to the penstocks, of which there are ten, with an additional one for the auxiliary, or service generators. The entrance to each of the main penstocks is divided into three openings, each 12 ft 8 in wide and 28 feet high. The penstocks lead down the face of the cliff to the turbines in the generating station. This vast building is 560 feet long. 135 feet wide and 180 feet high. There are nine floors in the structure, which is built of steel and reinforced concrete carried down to the solid rock. The turbines are arranged vertically, with their generators above. Each turbine unit is encased in concrete. Of the generators only the upper bearing brackets, main thrust-bearings and exciters can be seen above the main floor of the building. The bearings of each unit support the entire weight of the turbine runner, the great steel shaft, the rotor of the generator and the exciter—a total of 340 tons. A sense of the uncanny is conveyed by these giant spinning tops, humming in their concrete caverns and yielding power at 12,000 volts. With this power transformed up to 110,000 volts, their might is felt as far west as Windsor and Sarnia, Ontario, the electric power being conveyed for a distance of 250 miles. Round Lake Ontario to Toronto the generators send the product of their industry and at 60,000 volts the electrical power spans Niagara River for the use of people in New York State. It is fitting that electricity should pay tribute to the mighty Falls at Niagara. For two hours on every evening of the year both Canadian and American Falls are illuminated by batteries of searchlights - a vast blaze of more than a million candle power. The lighting is in an ever-changing variety of colour, as the roaring waters fall from the blackness of night to clothe themselves in hues of every shade, falling majestically to the depths below. IN WINTER THE FALLS ARE SOMETIMES FROZEN from bank to bank, but the work of the hydro-electric power stations is not interrupted. Water is still available beneath the ice, and all the intakes are provided with openings many feet below the surface level. These intakes are equipped with racks or screens which remove ice and floating debris and ensure an uninterrupted flow of water. Additional illustrations from the photogravure supplement can be seen here.